We already know that gun violence exacts enormous costs. The fear of gun violence, and people's perceived risk, has been shown to impose heavy social, psychological, and monetary burdens on individuals that translate into monetary costs to society. We also know the health care costs of treating gunshot injuries: just under $630 million i n 2010 (Howell and Abraham 2013). American society collectively pays all these costs. 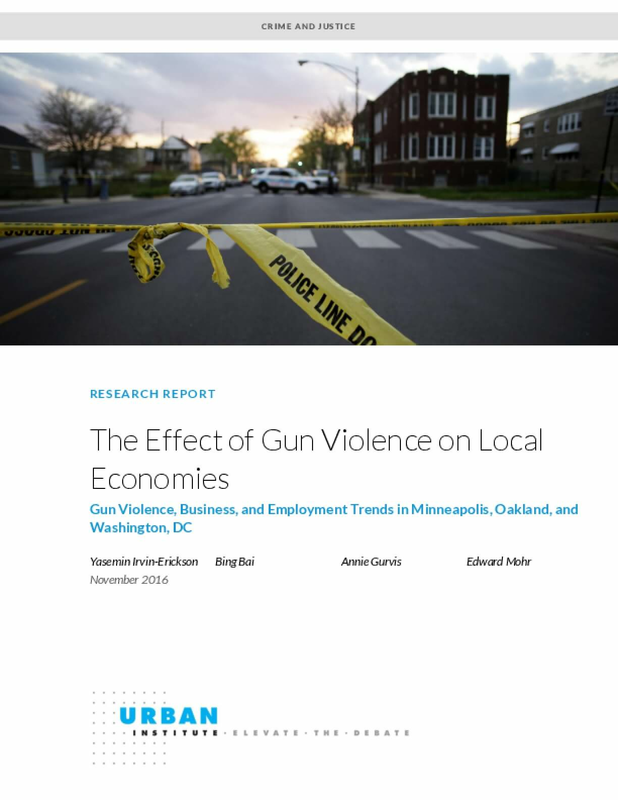 Yet we know comparatively little about the relationship between gun violence and the economic health of neighborhoods at the most grassroots levels ; we don't know how businesses, jobs, and many more indicators of economic health respond to increased levels of gun violence. Could gun violence cause economic downturns? In communities and neighborhoods most affected by gun violence, does the presence of gun violence hold back business growth? Copyright November 2016. Urban Institute. Permission is granted for reproduction of this file, with attribution to the Urban Institute.